HomeAll BlogsWhat is Kidazzler? || Is Kidazzler a scam? I decided to test yet another earnings opportunity. Unfortunately, you can’t wait for my results because then you’ll miss the opportunity altogether. I will share with you my findings, but please be aware that I never claimed that this is a legit opportunity – I have no way of knowing. The time will speak for Kidazzler or against them. Please continue reading and if you decide that you can afford the risk, click here to sign up. If you find the overall idea of Kidazzler interesting, you don’t mind waiting for your actual earnings and are willing to join the Kidazzler’s community, I encourage you to also read bUnited review. It looks like Alex Rehman, the founder of Kidazzler, was inspired and motivated by bUnited’s idea. His project, while different in many ways, seemed to grow out of bUnited’s prototype. 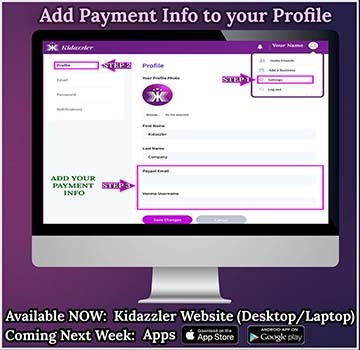 Kidazzler is a mobile app and a website for parents. 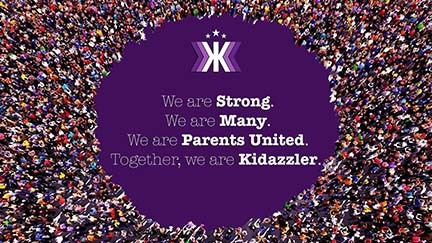 Kidazzler came up with the idea to launch a global directory for parents with places and activities for their kids: after-school education, sports, dance studios, arts and music classes, entertainment, restaurants, camps, pediatric services, daycares, clothing stores, toy stores, pet stores, and anything else that a family with children may be interested in. 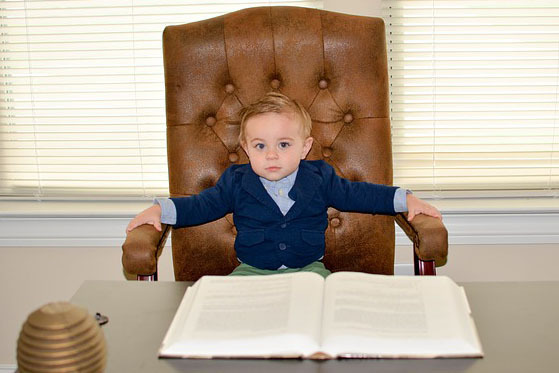 Basically, any child-friendly or family-friendly business will be listed in their directory. They claim that it will become a “One Place for Everything Kids” platform, a free parenting resource. Kidazzler invites everybody to participate in building such directory. There is no fee to join as a contributor. The company expects to earn revenue from the advertising businesses and reward everyone who participates in growing its directory and adds new listings to it with a share of it. 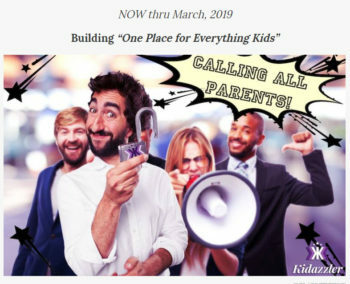 Kidazzler’s mission is honorable: they aim to offer, free of charge, a tremendous resource for all parents and help financially by introducing their “Shared Revenue Model” to those parents who decide to contribute. 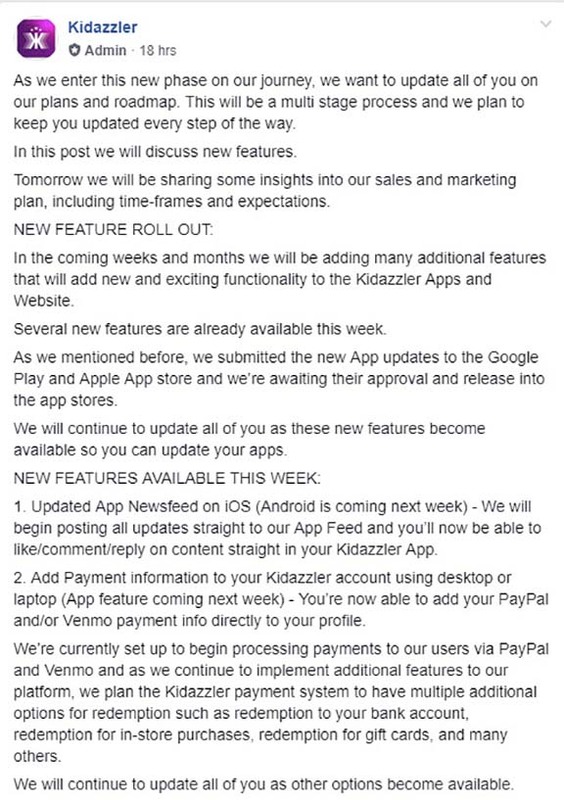 Kidazzler announced two phases. They are currently in Phase 1, which runs through March 2019. Their directory is not launched to the public yet. 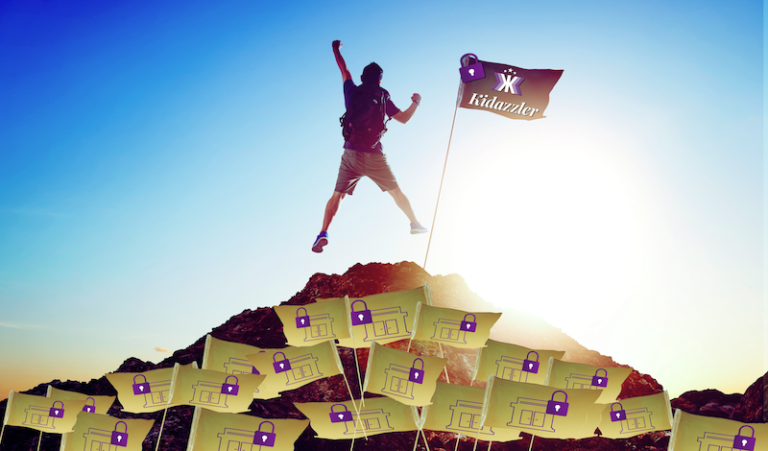 In phase one Kidazzler team and all the contributors build the directory, starting with the USA and Canada, but aiming to eventually expand globally. Until the end of phase 1, the directory will not be searchable. 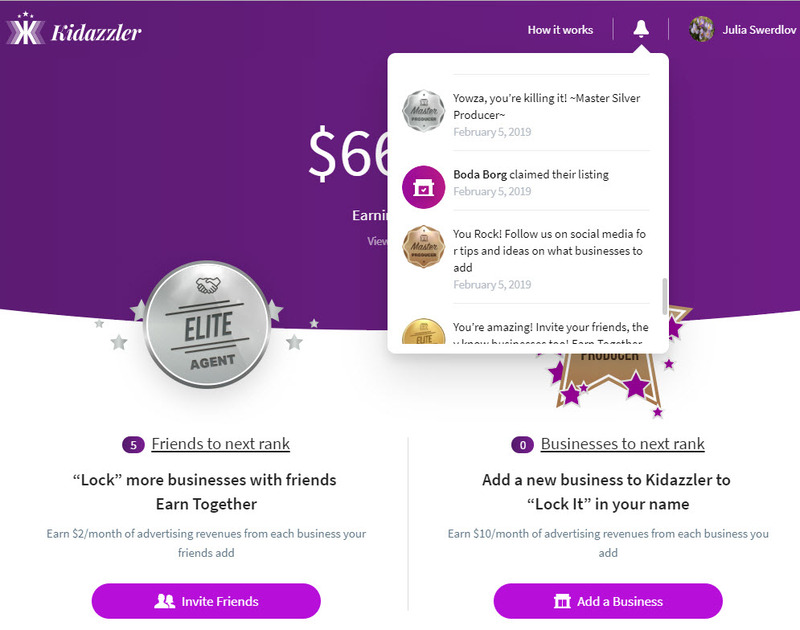 Contributors provide businesses’ names and contact information, Kidazzler team contacts the businesses and offers them to advertise on the Kidazzler platform. Phase 2 starts in April 2019. That’s when the businesses which agreed to advertise with Kidazzler start paying their fees, the directory becomes searchable, and the contributors start getting paid their share. What is Expected From the Contributors and What Reward is Promised to the Contributors? By signing up for FREE and downloading the app the contributors add the businesses in the app (or on the Kidazzler website if not using a mobile device) starting in the area where they live or anywhere in the USA and Canada. We, the contributors, are promised to earn $10.00 monthly from EACH business we put in which decided to sign up and be included in the Kidazzler global directory. At the time I joined Kidazzler, the maximum number of businesses I could “lock” in my name was 45. We don’t make any calls, we just find and add the businesses in the app or on the website. Multiple locations of the same business are considered individual businesses as soon as each location has its own unique phone number. The required information is a business name, phone number (must be unique! ), and street address. Optionally, we can add a business email and website. Kidazzler staff will call the businesses about the possibility of placing their advertisement in the directory. Once one person added a business, it is locked under this person’s name. This means that another member cannot add the same business again. The unique key is the phone number of the business. We can also invite friends to join under us and earn additional $2.00 per business they add! 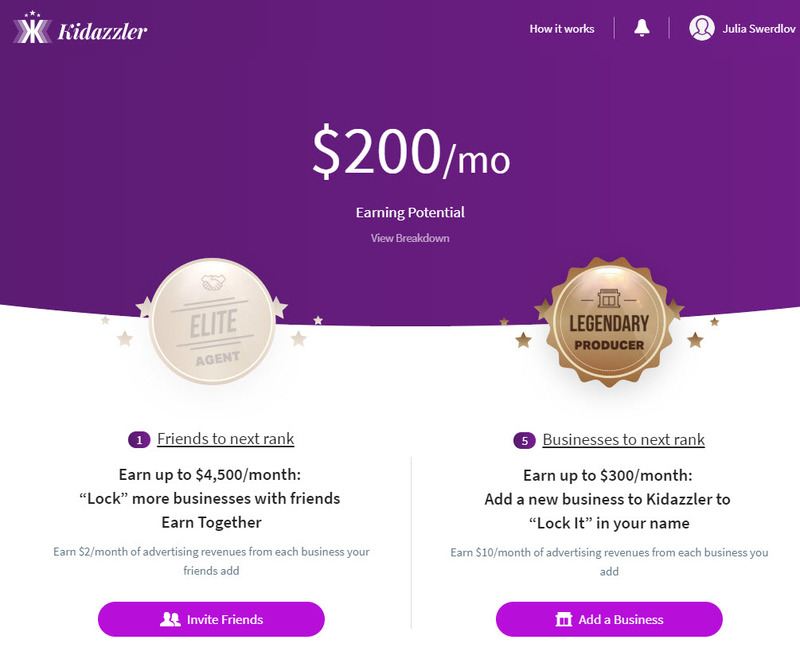 Basically, Kidazzler tells us that the company wants to share the revenue from the advertising businesses with us, their members and contributors. 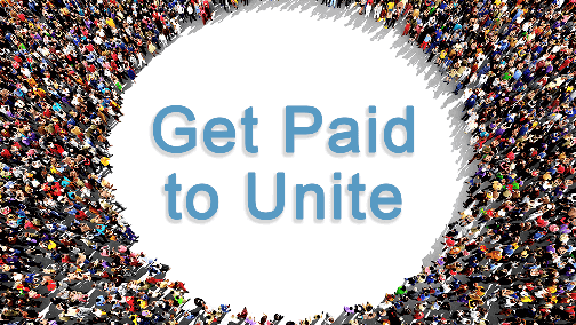 They claim that each one of us, as an active contributor, has a potential of earning up to $4,800.00 per month. My personal feeling after all the research I’ve done gave me a green light to sign up. The work of adding business contact information is not very time-consuming. This gig definitely cannot be considered “a job”, not even a part-time job. It’s a small project that, if turns out to be legit, may supplement your income from another source. If you are looking for a meaningful online occupation which leads to a sustainable income, use this link to read about the place where you can be earning while learning. So far, I spent about 1.5 hours of my time and added 20 businesses with their emails and websites (I visited each website to make sure I submit the correct information). I didn’t rush at all, and I am sure that many others could do the same amount of work quicker. I am planning to add 25 more businesses. The research of the company and writing of this article took me more time than all the work I’ve done so far directly for Kidazzler. I wrote this article to share my findings with you, my reader. It would be nice if you decided to sign up using my referral, but if not, I am okay with that too. I don’t want to lie to you. I’d rather show you a true picture and possible level of risk. If you don’t want to be scammed, join Wealthy Affiliate instead, an all-inclusive platform where you can learn all about affiliate marketing, build and host your own website, and run your own full-scale online business. In my view, the worst that may happen to me in this venture is that either none of my proposed businesses will decide to advertise with Kidazzler (though, Kidazzler convincingly believes that their platform will be more attractive to businesses of all sizes, than what their competitors have to offer!) or Kidazzler turns out to be a pure scam artist, and will not pay anything to anybody, but instead will close the business at the end of phase 1, and reopen under a different name sometime later using our collected data. That last phrase is a totally made-up assumption based on nothing – I’m just trying to imagine the worst possible scenario 🙂 In that worst case, you and I will lose the time we invested. I don’t want to waste my time, and I don’t think this would happen, but if it does, I am prepared not to stress out too much over it. Honestly, if this family directory will ever be launched, I don’t mind contributing to it even if I was asked to volunteer. Even a non-guaranteed possibility of getting paid makes the mission even more attractive. Free access to a huge assembly of kids-related and family-oriented places and services is a really thoughtful and generous idea, isn’t it? I want to believe that such an honorable idea is not being used to scam people. Wealthy Affiliate is your #1 choice for building a lucrative online business. I am a skeptic. “The hope that GOOD still exists in this world” was the drive for me to join in. If at the end this whole project turned out to be a scam, my biggest fear was not to lose the time I invested, but to lose that faith. I certainly wouldn’t lose faith in good people as I am lucky to have many in my life, but I would lose faith in honest entrepreneurs. I believe in Alex’s, good intentions and the good purpose of this project. I hope that they won’t let me lose my faith. Once again, you, my dear reader, make your own choice and trust your own gut. I want to thank YOU, my reader and my website’s visitor, for giving your feedback. Your comments keep me on my toes and encourage me to think of new resources for more information and to continue with my research. So, please do keep those comments coming! Today, while answering to the comment regarding validating Kidazzler’s website, I searched for the name of the founder of the company, and couldn’t find it. I sent a private message to Kidazzler on Facebook asking why they are thoroughly hiding the owners’ name, and what assurance could they give me that this company is NOT a SCAM. In about 2 hours, I received a polite and detailed response from Jennifer, the Customer Service Representative. First, Jennifer answered the “Founder” question. She wrote: “The names of the founders are not hidden. We don’t make an effort to publicize this information to protect their privacy, but we’re happy to answer this question when someone asks as we’ve done before in our Kidazzler Elite Inner Circle Group on FB.” Then, she gave me the Kidazzler’s Founder and CEO full name. Since this is a public website, I’d like to respect their attempt to protect this person’s privacy, and therefore I will not publish his last name either. Everyone who is interested in this information can contact Kidazzler via the link I shared above or in the Facebook group that Jennifer mentioned. His first name is Alex. Everyday I talk to so many people across the country and I hear their stories of hardships. It’s sad to see so many people hurting and not having many options to make more money to improve their lives. Even the people that have good paying jobs also feel unhappy. The pressure of not having the freedom to do what they want and feeling stuck in their own un-ending cycle of working countless hours just to pay the bills can be overwhelming at times. The way I see it everyone struggles in life. Stress and moments of depression hit everyone, no matter who you are, where you live or how much money you have. Just because our circumstances may not be ideal today, DOESN’T MEAN that’s the way it has to stay. So I had this idea. Billions of people use many social platforms today, and we now understand just how important our daily participation is to their success. Every time we like, share, comment, log in to these platforms, we help attract more and more businesses to advertise and spend millions or even billions in advertising dollars. What if there was a way for all of us to do what we do on social media and continue being a part of the success story, while at the same time also being a part of the earning story? I believe that with so much money in advertising today, there is plenty to go around to the company, users, investors, businesses, and everyone else. The fact that the real person behind this business is disclosed, adds another bit to my trust and, hopefully, yours too. My additional research did not change my final statement: there is no way of guaranteeing that this business is legitimate until people start receiving their share of the revenue. However, my trust builds up on my new discovery and my personal experience communicating with Kidazzler’s representative. I hope that you, my reader, are feeling the same. If so, join Kidazzler while they are still in phase 1. But, if you are an incorrigible skeptic, then you might be the only person whom you would trust. 🙂 No problem! Build your own online business with the help of Wealthy Affiliate, and you won’t be scammed for sure. By the way, if you do decide to join Kidazzler, you are still welcome to join Wealthy Affiliate – these are two completely different opportunities, and one is not in the way of the other. You can manage both; they won’t interfere with each other. Happy earnings! Today, I received an email from Kidazzler. It explains a notification I see under the bell icon on my account page stating that one of the businesses I entered “has claimed their listing”. It only means that this business verified their name, phone number, and address I provided. They created a business account with Kidazzler for free. This is not bad news, but unfortunately, the business didn’t pay to advertise just yet. We are still waiting for Phase 2. Kidazzler tells us that the directory grows quickly. 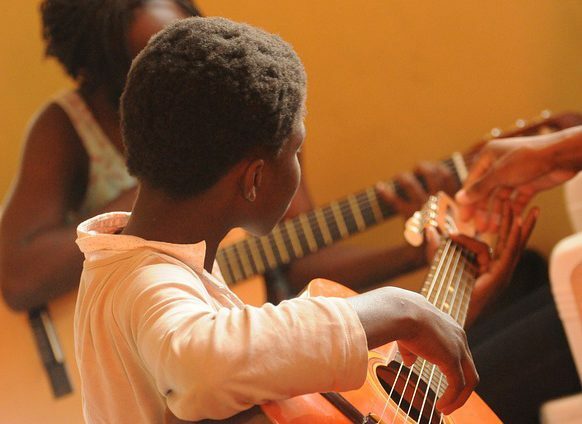 Therefore, they are opening more space to provide an opportunity for parents to participate in Phase 1. The new maximum number of businesses a single member can add is 50 (5 more slots were recently added). So far, Kidazzler’s behavior does not give any signs of a wrong intention: they stay in touch, they keep us updated, their website is functioning well, their actions are logical… While they don’t generate any revenue, they have nothing to share with us. It seems like they do more work than each of us does for them, and they also don’t produce any profit to be paid for their efforts. I am very hopeful that this company can be trusted. However, even if Kidazzler keeps all its promises, please don’t count on this opportunity as your main source of income. Sign up and do for them as much as your time permits. Don’t sacrifice any time required by of your other obligations for this work. Remember that nobody can guarantee that the businesses you entered will choose to advertise with Kidazzler. Think of this venture as your possible supplemental passive income – not your main job. While it’s impossible to give 100% guarantee that Kidazzler is a legitimate company until they start paying out to their members, my research convinced me that the risk is minimal and in the worst case scenario, the possible loss of invested time is tolerable. No financial loss is involved since it’s a FREE opportunity. Basically, the main question is: should we do the work now and trust Kidazzler’s promise to pay us later? It’s up to you to decide… I lean toward trusting this company, and at the same time, I am prepared to be scammed. Do you think Kidazzler is trustworthy? Would you take this opportunity with a small chance to be scammed? … and don’t forget to also read bUnited review. I found a lot of similarities in these two initiatives. Even some images in their promotional material look extremely similar. Please let me know in the comments below how you feel about this opportunity. I am interested to hear your opinion. If you are already a member and were lucky to win a prize, please tell us whether Kidazzler paid it to you promptly. Go ahead, waste your time! Thank you so much for voicing your opinion. I appreciate your feedback. I wrote this article to show people that there is no guarantee in Kidazzler’s offer, explain the risk, and show two possible outcomes. Your choice is one of two possible choices people should make after learning about this company. For those who don’t want to take any risk, I do recommend to join Wealthy Affiliate. It sounds like you are a very organized person and never waste your time. I envy you! I have to admit that I do waste time on silly things like playing computer games, browsing Facebook, chatting with strangers just to be polite, and not because I have an interested in the topic… Therefore, spending a total of 4 hours on researching family-friendly businesses in my area didn’t feel like a complete waste of time even if I won’t get paid. It was interesting and kind of helpful for my own knowledge. Even if I worked for free, it was my conscious decision to take a small risk. I prefer to think positively. I try to start an acquaintance with an attempt to trust (whether it’s a person or an organization). I want to believe in honesty and kindness. My 50-years experience proves that they do prevail. I am not naive, and the purpose of this blog was to warn those who might be too trustful. Understanding the situation and knowing the risk will reduce our disappointment if this business turns out to be a scam because I and my readers were prepared. However, if this was an honest attempt to put together a directory of family-friendly businesses and pay a part out of signed-up companies fee to the contributors, then those of us who decide to “work for free” at the moment, will be rewarded. Even if one business out of 45 will sign up for advertisement with Kidazzler, the member will receive $10 monthly. This means that a year of subscription from only one business will pay me $120.00. Divide this amount by 4 hours I spent to enter all 45 businesses – my hourly pay is $30.00, which is not bad at all. And there is a possibility that more than one business will advertise with Kidazzler considering how big and already popular their database is… then, there is a chance to profit. So, I wrote the article to make sure that whatever decision my readers make, it will be an aware choice. You feel like it’s a waste of time, and you don’t want to do this. I don’t feel too sorry for the time I spent. Either of us has reasons for our choice, which is exactly what I was trying to achieve. I wish you to find a risk-free opportunity and much success. Thank you again for your comment. Beside the model of the business of the site might be a question I was reading carefully all the facts you carried together. To validate the services you use to validate the page and the rating. Well, here comes the downside. https://www.scamadviser.com, for example, seems also not being very successful on validating sites, they are using limited mechanics and rely more on primitive elements of a site. So, nothing which really helps. Well written and valuable for everyone who wants to use the site, give it a try. Unfortunately, it is common to misunderstand the main goal and function of the ScamAdviser.com. ScamAdviser does not validate the services. Its purpose is to validate websites. Basically, ScamAdviser performs “WhoIs” search and checks several other sources for transparency and accuracy of a website registration such as the IP address of the web server, the age of the URL, the availability of contact details on the website, visitors’ feedback and more. ScamAdviser then interprets the data and presents it to us in easy to understand format. I didn’t use the ScamAdviser to validate the legitimacy of Kidazzler’s services and the Kidazzler as a company. 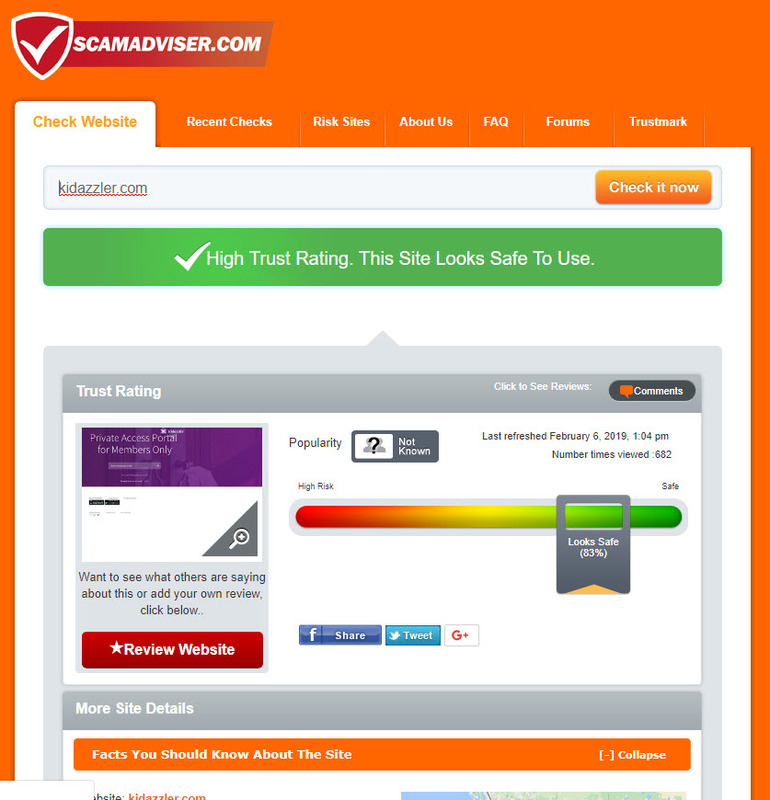 The fact that their website received a high trust score just a little bit reduces the doubt but gives no guarantees. On the other hand, if Kidazzler’s website showed weak trust results, I would not even consider participating and would suggest others to keep away. I am glad that you brought up the point, thank you. I probably shouldn’t assume that people know and understand the ScamAdviser’s functionality, and provide an explanation in the article. Hi Julia, yes this is exactly what I was testing. It is telling where the hoster is, but not who is the site. I tested it with a couple of sites I made for my clients and it always refers to the hoster not who the site is. The Whois is not displayed correctly… 🙁 What does it mean: is the hoster poorly rated, or the website is poorly rated? It might not be the only thing to look into, so I hope the other elements work better. And one thing is good — the reviews. Nobody gives good reviews for fun, right? Thank you. Based on ScamAdviser’s own description of their services, I can only speculate what their application code might be doing… I manually looked up in WhoIs directory where kidazzler.com domain is registered. It’s registered with GoDaddy.com for 10 years (2016-2026) How could this data help us in our analysis whether the company founders are scam artists? Well, GoDaddy is a reputable registrar, and while the Kidazzler’s subscription is private, which means that we can’t view admin’s contact info, it is available to GoDaddy, and the validation of it could be accessible to ScamAdviser via API. 10 years of registration hints for good intention. Kidazzler is hosted on a secure server using SSL protocol. That’s another credible step on Kidazzler’s behalf. All of these little details do not prove that Kidazzler is a legitimate business, but if they were negative, they would raise big red flags. Do you agree? Therefore, I believe that analyzing a business’ website is one of many important steps in validating the company. Besides, I contacted Kidazzler and found out who their founder was. Jennifer, the customer service representative, said that they don’t hide his name, but don’t want to publicize it either in order to protect the owner’s privacy. Therefore, I won’t print his name here either, but whoever wants to know can contact Kidazzler’s via Facebook private messaging (https://www.facebook.com/Kidazzler). I happened to have mutual real-life friends with the founder. I am waiting to hear their feedback. The business I work at was just “invited” to join by someone from Kidazzler. I found your article while trying to research the legitimacy of the site. It seems that businesses like the one I work at are the ones expected to pay for advertising so these families can profit – but I can tell you that we are a very SMALL business, and paying for advertising is not something we do often (nor do we spend very much at ALL), because we ALSO could use extra money, versus another way to spend it. In theory, if families in our area made money from this site, and they chose to spend it at our business it would create a virtuous circle – but there are no guarantees that would happen. So… I think THAT’S the catch. Maybe if enough businesses are able to advertise it will work, or if there are large enough businesses that can spend a lot of money for the exposure, it will work. For us, I think I don’t want to feel the pressure to advertise. But maybe we’ll see what’s being said after April, and whether it’s worth being listed for free. Kidazzler invites all residents of the USA and Canada to participate in building their directory. Every participant, and there are thousands now if not millions, is able to enter (currently) 55 businesses. 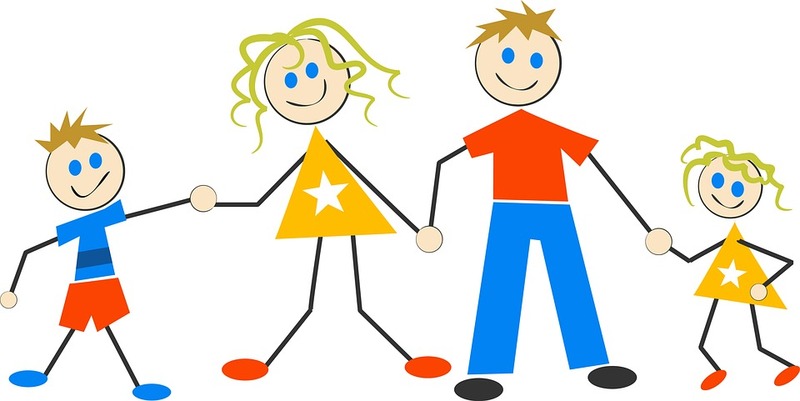 There is no restriction other than these businesses must be family-friendly, which basically means every possible business other than “adults-only”. When I started 2 months ago the limit was 45 businesses per person. Two months ago, most of the big businesses were already “locked” by others. I was still able to add a few big companies and the rest were mid-size. Then, Kidazzler opened up 5 more to the limit, and recently 5 more. When I was adding the last 5 companies, it took me much more time to find those which were not already in their database. We all understand that there is a better chance that the bigger business will advertise with Kidazzler than a smaller one. We all understand that “Potential” earnings amount is not the same as actual earnings: participants will only get paid a small portion of the advertising fee from the businesses that agreed to advertise with Kidazzler. However, there are only 10 days left in phase 1, and people are still trying to find businesses, which are not already added by others. So, the participants had to move on to smaller businesses. That’s probably why your business received an invitation now – close to the end of Phase 1. Having said that, most businesses, even the smallest ones, do advertise… unless the capacity of the business does not require advertisement, and a ‘word-of-mouth’ marketing technique is enough to reach full capacity. For those businesses that benefit from a larger number of customers (most businesses do! ), success depends on the right kind of advertisement. 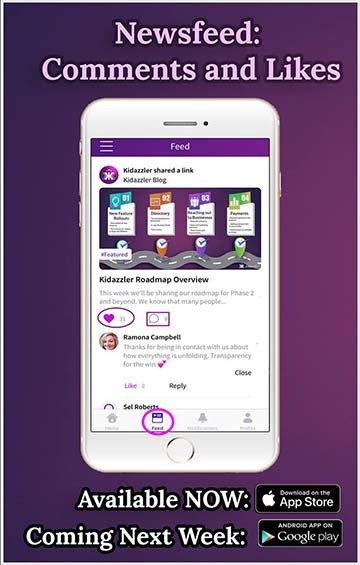 Kidazzler, because it rolled out such a huge campaign, will attract businesses by its volume, popularity, and convenience use of a mobile application. Remember that each participant is also a user, and the directory will be free for users. So, if a company chooses to promote its business in one and only place, Kidazzler has a better chance than any other advertisement platform. You too as an individual (not a business representative) could participate in “locking” other businesses. We only submit public information that is available on “Google My Business” and on business’ websites. Even if 5 businesses out of 55 agreed to advertise on Kidazzler platform, you’ll get $50 monthly. Of course, it’s not a living providing income, but it’s a residual income stream for a task completed once, which can pay for your gas, for example. So, nobody enforces a business to advertise with Kidazzler. Since someone has submitted your business’ contact information, you were invited to advertise there. While they are in phase 1, you must have received an automated email asking to confirm the business existence (your physical location and contact info?) I don’t think that Kidazzler team when they contact your business, will be insisting – they got too much work in their hands. They’ll hear from you “no, thank you” and they will just move on to the next name in their list. I am convinced that a lot of businesses will accept Kidazzler’s invitation considering it a better marketing strategy than whatever they currently use. I wish you all the best and great success to your business (or the business you work at)! I appreciate that you are trying to take a balanced approach to describe the risk of getting involved with Kidazzler. Frankly, this is a risk-free venture only if you don’t value your time. A consumer can do a Google search to find all kid-friendly businesses and activities, not just the ones added to an app. Kidazzler’s website and all the videos people are making about it focus on how it makes money for them, without saying what the app does. In terms of an opportunity’s legitimacy, that a very big red flag. Kidazzler is forthcoming about the difference between potential and actual earnings using the platform. When it comes to sales, there are no guarantees. The issue is, they have no incentive to not change or eliminate their residual income program as soon as they are up-and-running, meaning participants are left with no recourse and little money to show for the hard work of inputting data and getting people signed up. It’s not like taking a job where you work solely on commission. You are doing for free what it would cost them a few thousand to have done, and hoping they continue to pay you when the work is done. Recording artists make pennies for each individual album that sells. It is unlikely anyone will regularly get $10 a month for copy-pasting a business’s contact information. A well-written webscraper could do that work with little-to-no human intervention. Keep your eyes peeled for the mention of “Kidollars” on the website. Item 8.6 in the Terms of Service explicitly refer to them as “peer-to-peer digital assets.” It’s basically a currency that has no value anywhere else. How upset will you be if the maximum amount of cash you can have deposited in your bank account is limited to a pittance, and the lion’s share of revenue you earned can only be redeemed as credit at stores registered in the Kidazzler database? What if your residual income was 200 dollars a month in store credit at Baskin-Robbins and Chuck E. Cheese? The duration of the domain registration is not indicative of much. If I wanted to start an app called furazzler (a one-stop app for pet-related businesses), it would only cost about $125 to register the domain for ten years. It’s quite possible they registered back in 2016 because there was a substantial discount available on GoDaddy. Serial entrepreneurs typically buy up a bunch of domains and come around to making something of them when they get an idea. To see if this might be the case, I looked for more information on the owners of the company, but it’s hard to come by. I found their first and last names on my own. Beyond that, the best I could do was finding they incorporated as JAR Global, Inc. a couple of years ago, they have no general web presence, and they claim to be in advertising. An advertising and marketing consulting firm consist of three people with no public profile of any merit, and the company doesn’t have a general website. It is incredibly cheap and easy to throw together a webpage and outsource app development. None of this was made from scratch. Their website’s source code indicates the splash page was made in Angular and their blog was made in WordPress. These development tools make it extremely easy to turn around a professional-looking website in a couple of days. Their hosting is provided by Amazon Web Services, which is pay-as-you-go and doesn’t involve any sort of lengthy contract. They pitch a few dollars to the people who have significant downlines to make “true believers” of them and encourage more people to sign up. Even including the cost to incorporate, I would venture to guess it cost them less than two thousand dollars to get Kidazzler where it is right now. That’s hobby money. They can shut it all down whenever they like and think nothing of it. From an outside perspective, it seems like people involved with Kidazzler are blinded by the idea of passive income to the point where they are gambling with time and effort on the slim chance that these people will want to continue sharing tens of thousands of dollars every month even though they don’t legally have to. Why do all this, then? A massive database of cold leads and a list of contact information for people who are looking to become entrepreneurs but lack the capital is pretty valuable, to say the least. Oh, wow! Thank you so much for your comment. You’ve done such a thorough investigation! It’s a great addition to my article for readers to consider. I truly appreciate your time. I think you might have spent more time on this investigation than I entering all 55 businesses in Kidazzler’s application. I know, I also spent more time investigating the company, but most people don’t, and the risk for them is to lose a few hours they spent on copying and pasting businesses’ public info. You and I have a bit different level of suspiciousness and negativity. I said: in the worst case scenario, all you lose is about 5 hours of your time (well, 1.5 hours I spent to “lock” 20 businesses; and there is currently a limit of 55). You said: “this is a risk-free venture only if you don’t value your time.” Not many people would say “I don’t value my time”. However, most of us with an attempt to be honest to ourselves would admit that we wasted more than 5 hours in our lives without even a chance to get paid. One example of wasting time that could be used (and possibly wasted anyway) for Kidazzler, is when parents are waiting for their kids for one reason or the other (and there are many occasions when we have to wait for them), or waiting for your doctor appointment when the doctor runs behind the schedule… I am sure that there are many options when the time that would be wasted anyway could benefit you from or be wasted on Kidazzler. I just joined this venture today and was doing some due diligence on the opportunity. I am glad I came upon your blog. Thank you for all of the invaluable information. I figured I would give this a chance and see where it goes. I feel like you that the worst that could happen is that I wasted my time since no money is asked to join this opportunity. I am a pretty fast typist and fairly good at researching, so I was able to add 20 company’s info in about 30 to 40 mins. The biggest part is finding companies that are not already in the Kidazzler database. I will keep at it and add all the organizations I am allowed to and then I’ll wait and see how this pans out. It will be an excellent residual source of income if they pay us. I have started recruiting in hopes to get some other folks on board. I would like to be able for my down line to earn from this as well. So here is hoping this turns out to be legit and that Kidazzler will start paying members soon. I was wondering how you feel about the program today? Thank you very much for your feedback. I am glad that you found my blog helpful and that we share the view on Kidazzler. My last update in the post was made 2 days ago. The more I learn about the company, the more I DO NOT believe that their goal could be to scam their members. I recently came across another company that I call Kidazzler’s “mother-in-law”: while there are no signs of formal relation or a partnership between the two, Kidazzler seemed to adapt and redesign bUnited’s idea of creating a huge united consumer which by its size would be powerful enough to attract big companies and have a strong voice in directing them to act in agreement with a good cause. I mentioned the similarities above in this article. bUnited is also NOT a scam. Please read my review of bUnited. You may want to join this company too – they require none of the work from their members other than referrals. Every for-profit business wants to earn a good profit. Kidazzler and bUnited are Not exceptions! Their members, their “huge united consumer”, is their product which they trade with the companies. They expect to earn very profitable revenue from companies’ advertising fees. A fraction of their revenue, which they are offering to share with their members, is a net cost of their product: if they don’t pay their members, they won’t have “one huge consumer”. Understandably, it will take time before Kidazzler starts receiving fees from the businesses and paying us our share. We must be patient, but in the end, we should be getting some (not as huge, of course, as our “potential earnings”) residual income. Thank you again for your comment, and all the best to you!